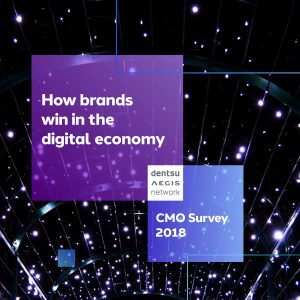 Dentsu Aegis Network published its first annual CMO Survey highlighting the key challenges of 1,000 Chief Marketing Officers across 10 top global markets. The survey dives into a variety of issues facing marketers such as difficulties connecting with consumers, the dynamics of working with agencies, data regulation fears and new barriers for growth. 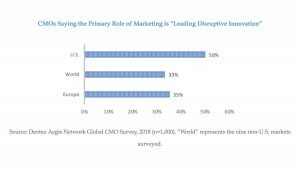 Despite these challenges, the study finds that not only are US CMOs more confident than their peers in other regions, they believe that a primary role of marketing is to embrace and lead disruptive innovation. In fact, US CMOs see emerging technologies as the top opportunity for marketing in the next two to three years. Additionally, US CMOs report that their role is increasingly tied to the strategic drivers of the business. At the same time, budgets are growing steadily. In fact, 69% of US CMOs say they expect their budgets to rise this year, compared to 61% of CMOs in other markets. Only 16% say they expect their budgets to fall. The survey findings also show that a rising profile and responsibilities can bring the potential for tension in the C-suite. Forty-eight percent of US CMOs say that competition with other leaders in their organisation is one of their key internal challenges â much higher than the 34% of non-US CMOs who report facing the same problem. Growing budgets put pressure on CMOs to deliver results. Fifty-eight percent say the âprimary roleâ of marketing is to deliver growth. This mandate is rated more highly than other important roles, such as developing customer experiences (55%) and effective brand management (51%). Non-US CMOs are even more adamant about marketingâs role in delivering growth. Sixty-five percent of non-US CMOs cite it, as do 64% of Eurozone CMOs (Germany, France, Italy and Spain) and 63% in the UK. US respondents have a greater appetite for people-based marketing initiatives than other regions. For example, 83% agree that in order to maximise consumer engagement in the next two to three years they need to be able to use data to reach real people â higher than quality content (71%) or social purpose (69%). Overall, US CMOs are most confident in their approach to data â 85% agree that they have a âclear data strategy.â This is 13pp higher than the non-US average. And, 87% agree they âhave an impactâ on their companyâs data strategy (+10pp vs non-US CMOs). CMOs all over the world are more inclined to see big platforms, such as Facebook and WeChat, as frenemies rather than opportunities. In the US market, a greater percentage of CMOs say they see such platforms as a risk (65%), rather than as an opportunity for partnership (49%). Indeed, US CMOs are the most alarmed by the dominance of large platforms of all markets surveyed. Among non-US CMOs, only 44% see them as a critical risk. Despite rumours to the contrary, US CMOs stand out in our survey as having a much more positive view of their agency partners than CMOs in many other markets. Admitting challenges, 42% of US CMOs agree that their agencies are âstrongâ at delivering integrated solutions across the marketing mix â four times higher than non-US CMOs. And one-third of US CMOs say their agencies are âstrongâ at delivering performance pricing, efficiency and partnering to drive long-term execution, which is up to three times higher than non-US CMOs.